Run-up for Wairarapa earthquake tsunami. 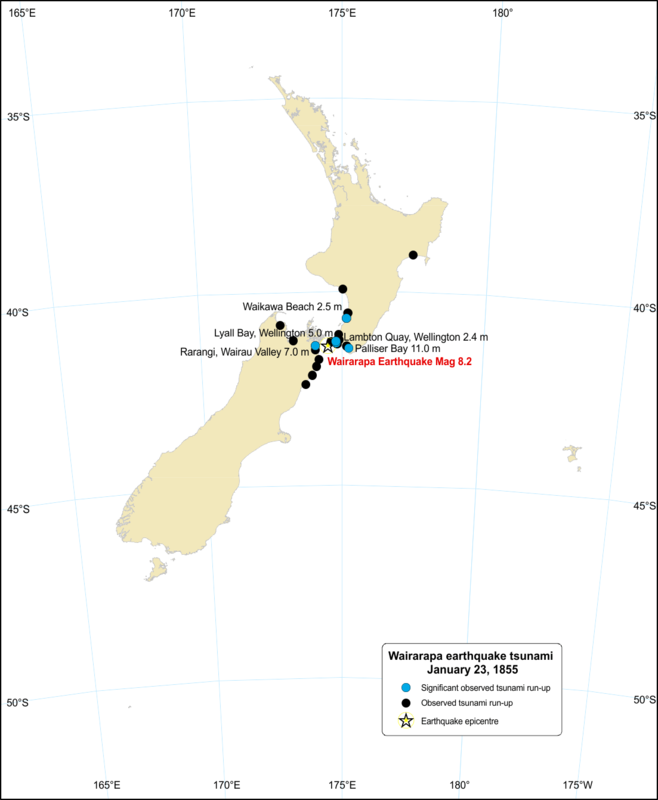 The 9:32pm, 23 January 1855 M 8.2 Wairarapa earthquake generated New Zealand’s largest historical locally-generated tsunami. The tsunami most affected the Cook Strait region, but the effects of the tsunami were observed at least as far north as Waikawa Beach, where fish were deposited above high water mark, and as far south as the Clarence River mouth and possibly Kaikoura. The greatest known height (10-11m) reached by the tsunami was at Te Kopi in Palliser Bay, where a shed on a cliff 9m above the sea was swept away. Nearby, at Whangaimoana, a tool that had been on the shore at the time of the earthquake was found many years later in a location 10m above high water mark. Within Wellington Harbour, water levels varied considerably. Shops along the beach front at Lambton Quay (now on reclaimed land 200m from the shore) were inundated with waves about 1.4-2.4m above sea level at the time immediately after or during the earthquake. The source of the tsunami within the harbour was separated into three different components: the horizontal movement, causing an immediate "slosh"; differential vertical movement across the harbour; and the much greater deformation in Cook Strait and extending across the whole region west of the fault. For a local source tsunami, the duration seems to have been quite long, observations consistently indicating that in Wellington harbour and in Cook Strait water levels oscillated for 8-12 hours.